Chicago – Data from phase 3 clinical trials presented at the 2018 ACR/ARHP Annual Meeting suggest that newer oral Janus kinase (JAK) inhibitors may change the order of treatments in patients with rheumatoid arthritis (RA). In one trial, an agent with a high degree of selectivity on the JAK1 relative to other JAK pathways was superior to both placebo and a tumor necrosis factor (TNF) inhibitor in a patient population inadequately controlled on methotrexate. In another, the same JAK inhibitor was found highly effective and protective against radiologic progression in the first-line setting. In a third trial, a different agent in late stages of development showed a high degree of activity in patients with inadequate response or intolerance to a biologic disease-modifying antirheumatic drug (bDMARD). The new data are shifting perception of these oral targeted agents. Tofacitinib, the first JAK inhibitor approved for the treatment of RA, has now been joined by baricitinib in some countries, but this class is poised to further expand with newer JAK inhibitors engineered for greater targeting of the JAK1 pathway. Of several phase 3 trials presented at this year’s ACR/ARHP meeting, one of these agents, upadacitinib, was associated with superiority over a TNF inhibitor as a second-line therapy. As yet, JAK inhibitors have not been compared in large controlled trials, but Dr. Fleischmann said that the potential for a greater clinical effect is supported by the SELECT-COMPARE trial, which he presented. In this trial, 1,629 RA patients with active RA inadequately controlled on methotrexate were randomized to 15 mg once-daily oral upadacitinib, 40 mg of the TNF inhibitor adalimumab injected every other week, or placebo. All remained on methotrexate therapy. 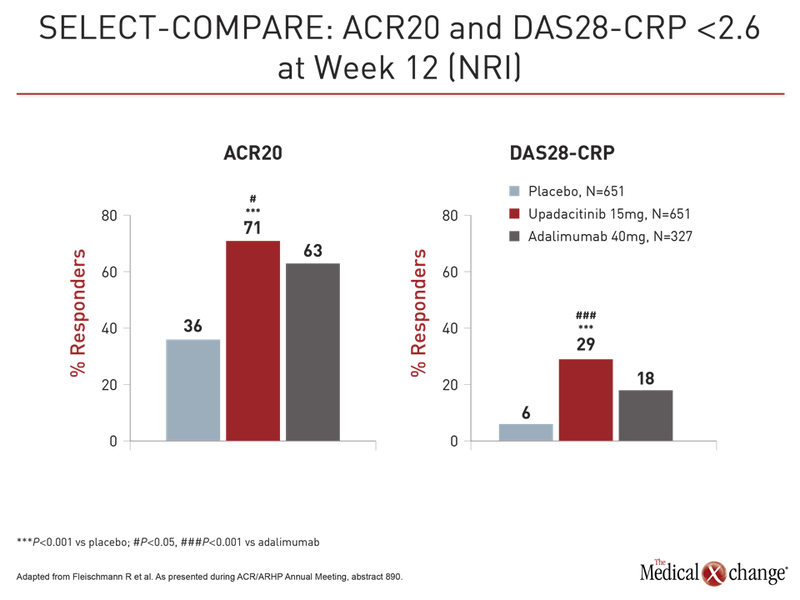 Both upadacitinib and adalimumab were superior to placebo on the co-primary endpoints of ACR20 and DAS28-CRP <2.6 at week 12 (Fig. 1). However, upadacitinib was also significantly more effective than adalimumab not just for these endpoints but also for a broad range of other measures, including Clinical Disease Activity Index (CDAI), Boolean-based remission criteria, and a variety of patient-related outcomes (PRO), such as those measured with the physical component summary of the SF-36 and the Health Assessment Questionnaire Disability Index (HAQ-DI). 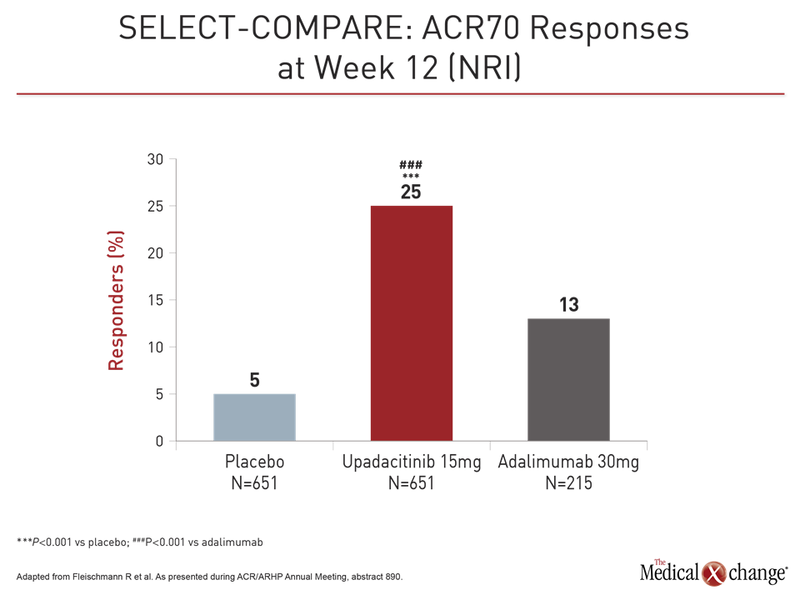 The ACR70 response was almost twice as high on upadacitinib (25% vs. 13%; P<0.001). Patients also responded more quickly on upadacitinib than adalimumab even with a study dose of upadacitinib 15 mg in this trial rather than the 30 mg dose tested in other phase 3 trials. 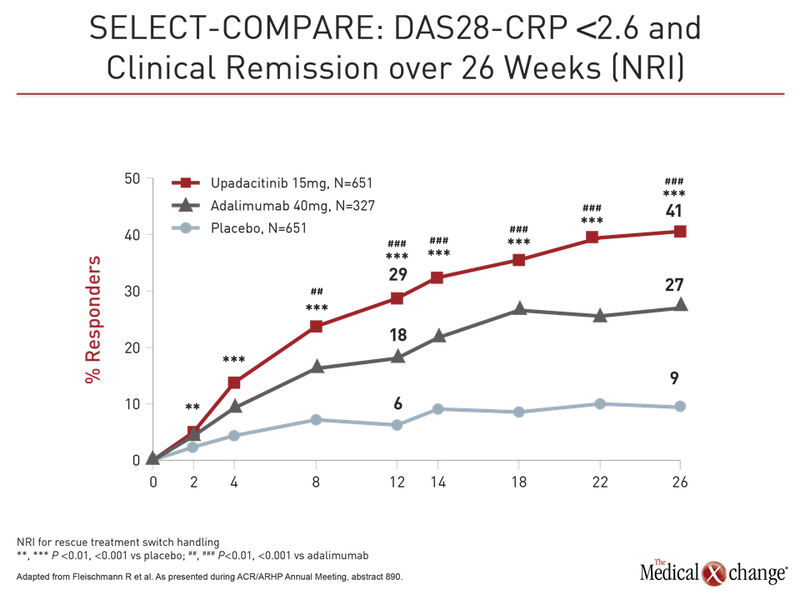 For example, response curves favoring upadacitinib for DAS28-CRP <2.6 began separating within weeks, reached significance (P<0.001) by eight weeks, and remained separate for the duration of the trial (Fig. 2). “The quick response to upadacitinib was not surprising. We have seen that in prior studies, but we expected adalimumab to catch up, but it never did,” Dr. Fleischmann reported. A previous trial with a similar design to SELECT-COMPARE did not shown an advantage for tofacitinib over adalimumab (van Vollenhoven RF et al. N Engl J Med 2012;367:508-519). However, Dr. Fleischmann cautioned against cross-trial comparisons and emphasize the need for head-to-head comparisons. 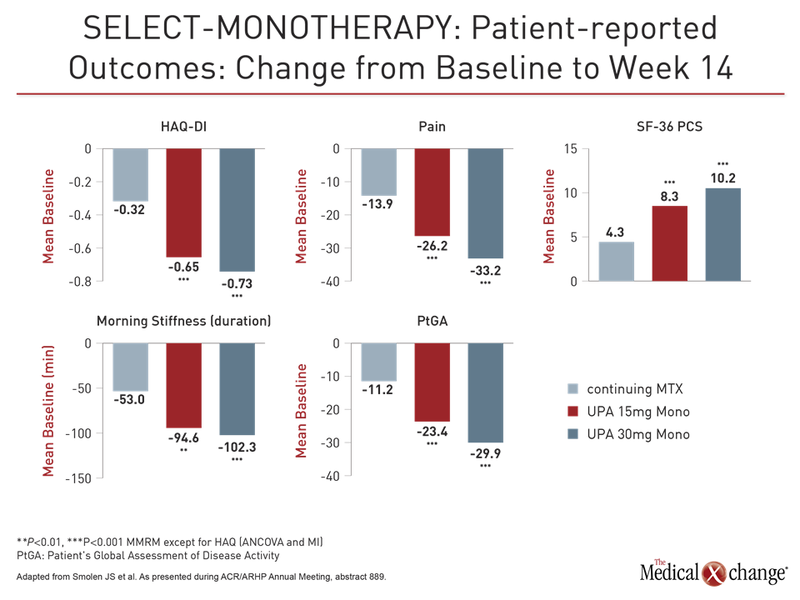 In SELECT-MONOTHERAPY, another large phase 3 trial with upadacitinib, 648 patients were randomized to continue methotrexate or switch to 15 mg or 30 mg upadacitinib. The primary endpoints, ACR20 and DAS28-CRP ≤3.2, were selected to meet the regulatory requirement of the US FDA and the European Medicines Agency, respectively. Both of the primary endpoints and all of the secondary endpoints were met, according to Dr. Josef Smolen, Chairman of the Division of Rheumatology, Medical University of Vienna, Austria. At week 14, the ACR20 was 41% in the group remaining on methotrexate versus 68% and 71% in the groups receiving 15 mg and 30 mg upadacitinib, respectively. For DAS-CRP ≤3.2 at week 14, these rates were 19%, 45%, and 53%, respectively. For each endpoint, the relative advantage of upadacitinib was highly statistically significant (P<0.001 for both doses). For these endpoints as well as ACR50, ACR70, HAQ-DI and CDAI, the response was rapid, according to Dr. Smolen. For example, the proportion of patients with an ACR50 response was significantly greater on either dose of upadacitinib (P<0.001) by two weeks. The greater proportion of patients achieving ACR70 response was significant by four weeks. The efficacy was reflected in patient perception. While the median HAQ-DI score of 1.5 at baseline fell by only 0.32 points in the methotrexate group, the score was reduced by almost half (0.73 points) in the 30 mg group and by only slightly less (0.65 points) in the 15 mg group (both P<0.001 versus methotrexate). Upadacitinib was well tolerated in these trials with no new or unexpected safety signals relative to previous trials with upadacitinib or other JAK inhibitors. Of adverse events of interest, such as venous thromboembolism (VTE) and malignancy, there were no significant differences between upadacitinib and control arms or any signal of a dose response for adverse events when the 30 mg dose was compared to the 15 mg dose. “VTEs occurred in all three groups,” emphasized Dr. Fleischmann, referring to VTE rates in the upadacitinib (0.3%), adalimumab (0.9%), and placebo (0.2%) arms of SELECT-COMPARE. Other potentially serious adverse events were similarly distributed. The one exception was herpes zoster infections, which were more common (2.8%) in the 30 mg arm than the 15 mg arm (1.4%) or the continued methotrexate arm (0.5%) of SELECT-MONOTHERAPY. In SELECT-COMPARE, these rates were 0.5% 0.3%, and 0.6% for the upadacitinib, adalimumab, and placebo arms, respectively. Dr. Fleischmann called the greater rate of herpes zoster in the upadacitinib arm “expected,” but concluded that the overall data indicate “upadacitinib is at least as good as adalimumab” with regard to risk of adverse events. In another phase 3 study, called SELECT-EARLY, upadacitinib was compared to methotrexate as a first-line strategy. In this trial, 947 methotrexate-naïve patients with moderately to severe active RA were randomized to 15 mg upadacitinib, 30 mg upadacitinib, or methotrexate. Patients were required to have at least one erosion on x-ray or positive tests for rheumatoid factor and anti-CCP antibody for entry, reported Dr. Ronald van Vollenhoven, Professor and Chief of the Department of Clinical Immunology and Rheumatology, Amsterdam University Medical Centers, and Director of the Amsterdam Rheumatology and Immunology Center, the Netherlands. At baseline, the mean HAQ-DI was 1.6 and the modified Total Sharp Score (mTSS) was approximately 18. The ACR50 response rates at week 12 were 28%, 52% and 56%, for methotrexate, 15 mg upadacitinib, and 30 mg upadacitinib, respectively. For the other primary endpoint, DAS28-CRP <2.6 at 24 weeks, the rates were 19%, 48%, and 50%, respectively. All values for both doses of upadacitinib relative to methotrexate were highly statistically significant (P<0.001). 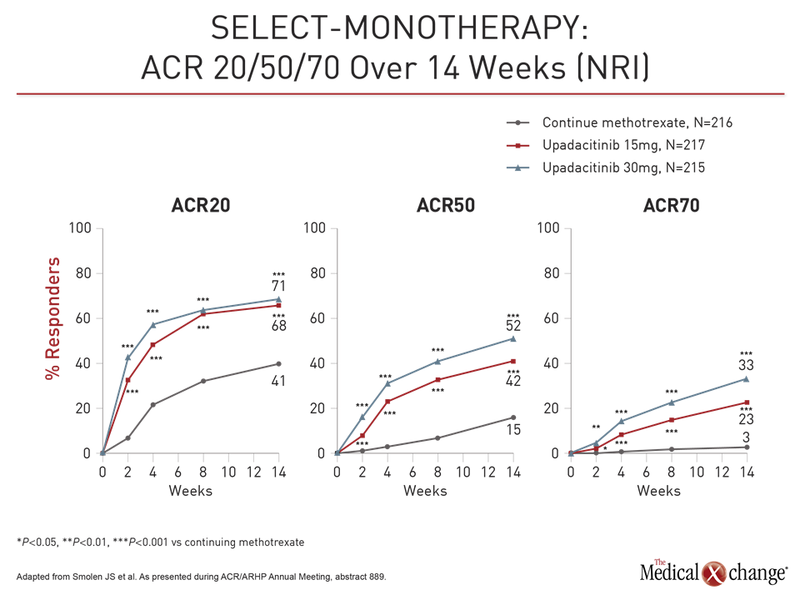 As in the other trials, responses to upadacitinib relative to methotrexate for these and other endpoints, including ACR70, CDAI ≤10, and HAQ-DI, was rapid. However, the inhibition of radiographic progression may be the most important finding in this study. 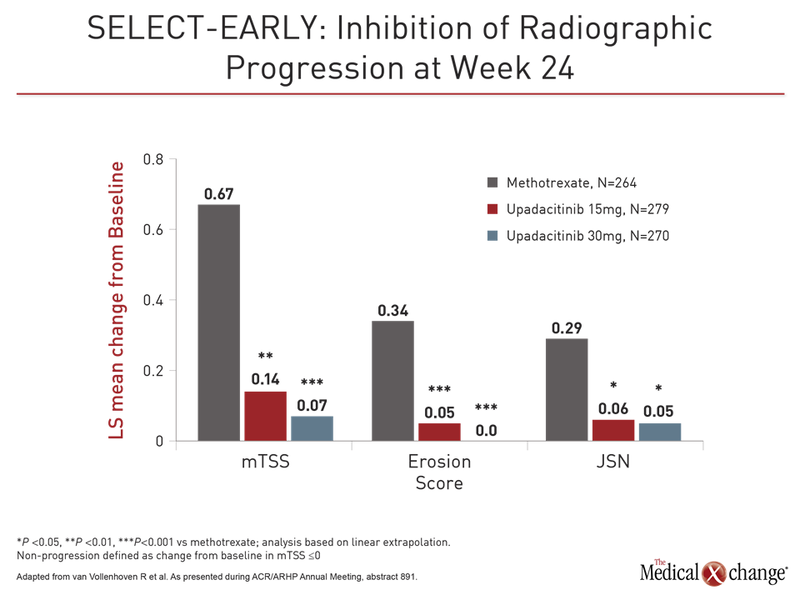 Relative to methotrexate, for which clear radiographic progress was observed, both doses of upadacitinib were associated with attenuation of joint structural damage (Fig. 3). “These differences were highly statistically significant even after only 24 weeks of follow-up,” Dr. van Vollenhoven reported. Suggesting that the positioning of JAK1 inhibitors is now “a big point of discussion,” Dr. van Vollenhoven said, “We know that there are patients with highly-elevated CRP and very active disease with a worse prognosis.” He suggested more aggressive therapy in these individuals might be appropriate. Phase 3 studies were also presented here on the novel JAK1 inhibitors filgotinib and peficitinib. In the latebreaker data with filgotinib, presented as a poster, 448 patients with highly active RA and an inadequate response or intolerance to bDMARDs were randomized to 100 mg filgotinib, 200 mg filgotinib, or placebo while remaining on stable conventional DMARD therapy. The primary endpoint of ACR20 at week 12 was achieved in about two times more patients treated with either 100 mg filgotinib (66.1%) or 200 mg filgotinib (57.5%) relative to placebo (31.1%; P<0.001 vs. either dose). “The data demonstrate that filgotinib is effective in patients with active RA who are not adequately controlled on biologics,” reported Dr. Mark C. Genovese, Director of the Rheumatology Clinic, Stanford University, Stanford, California. 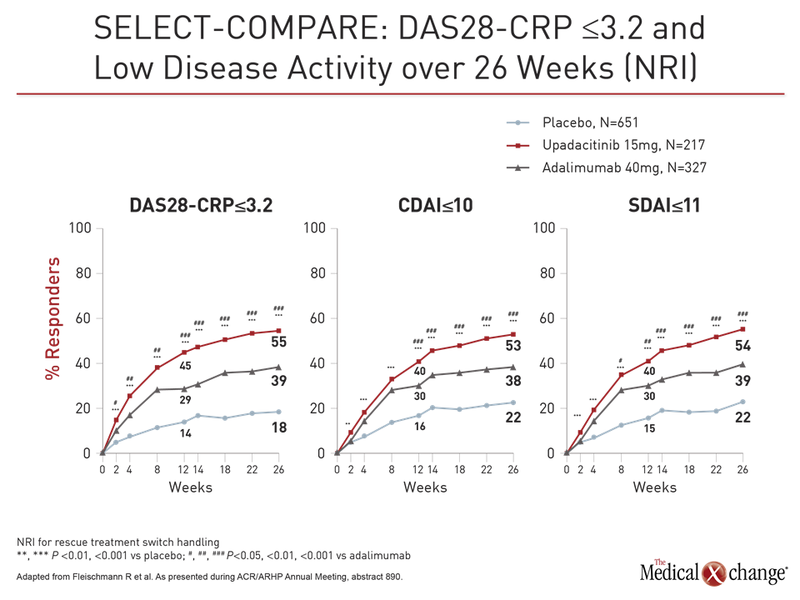 Like those presenting the upadacitinib data, he also emphasized the potential for JAK1 selectivity to provide greater clinical activity than earlier agents in this class. Like others, he also emphasized that controlled trials are needed. The peficitinib phase 3 trial, which randomized patients with an inadequate response to conventional DMARDs, was conducted in Japan, Korea, and Taiwan. Relative to placebo, both the 100 mg and the 150 mg dose of peficitinib met the primary endpoint of a higher ACR20 response at the end of 12 weeks. According to Dr. Yoshiya Tanaka, Chairman of the Department of Internal Medicine, University of Occupational and Environmental Health, Kitakyushu, Japan, a formal application for approval of peficitinib was recently presented to regulatory authorities in Japan. It is hypothesized that of JAK signaling enzymes, JAK1 is the most closely associated with inhibition of the inflammatory pathways active in RA and other autoimmune diseases. Following approval of tofacitinib, it has been postulated that JAK inhibitors engineered for greater selectivity on JAK1 than the other three JAK signaling pathways may provide greater anti-inflammatory effects with a lower risk of off-target effects. Although JAK inhibitors have not been directly compared in clinical trials, the emerging phase 3 data with novel agents such as upadacitinib and filgotinib support the premise that newer agents may expand and perhaps improve on treatment options for RA.